There are a number of Santa or Christmas theme tourist attractions across the country. Many of them are located near mountains (I'm thinking of North Pole, Colorado near Colorado Springs and Santa's Land near the Smokies) and many were found along old US Highways where, in decades past, thousands of travelers would be pestered by their kids to stop. A few years back, Jessica and I were heading back to Vegas from a road trip through the desert and we passed by Santa Claus, Arizona along US Highway 93. The site of this abandoned tourist attraction compelled me to do a u-turn to check it out. The main building is still visible and apparently it was once home to a restaurant, motel and a place where kids could mail letters to Santa. 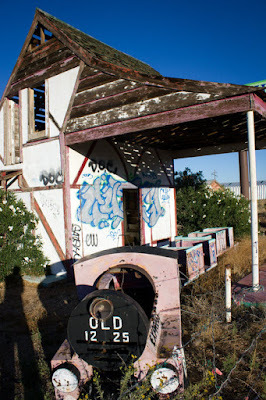 There are also the remains of an old Santa's train out front as well. It is now covered in weeds and there is graffiti everywhere. Arizona Highways Magazine did a brief history of the attraction on their site recently. It's worth checking out if you've ever passed by this place in between Kingman and Las Vegas, or if you're simply interested in this sort of Christmas-themed tourist attraction from the past. The actual calibre 3132 replica watches sale motion works from 3Hz having a energy book associated with forty five several hours. The actual 245-part motion is actually debuted inside a replica watches sale "openworked" type filled with the flashy red precious metal stability link. The actual movement's book idea is about the "two-sided" fake rolex sale steering wheel framework. The main fishing rod links the total amount tires along with hairspring buildings. Both of these tag heuer replica uk tires tend to be linked, however officially run individually. These people "average one another out" using the idea how the periodic rolex replica of 1 is going to be paid out through the much more "true" procedure from the additional. The total amount tires are in fact very near one to the rolex replica uk, to ensure that should you had been to check out the actual motion working and never understand what to consider, you may very easily skip after that whole tag heuer replica uk idea from the 3132. In lots of ways, this works like the majority of additional actions, however having a much more steady hublot replica uk program. Based on Audemars Piguet, this can be a very first 41mm-wide Regal Walnut watch situation to possess a skeletonized call. With that in mind, it's not the only real 41mm-wide Regal Walnut Openworked watch out for 2016.